Could you use another furry friend in your life? Just head to White Marsh Mall on Sunday. 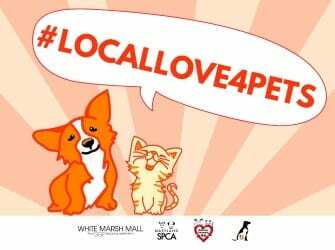 The Maryland SPCA, together with ReLove Animals Inc., Baltimore County Animal Services and the White Marsh Mall, invite you to join them for “Local Love,” a humane education event, on Sunday August 14 from 11 a.m. to 4 p.m. The event will be held in the White Marsh Mall parking lot across from IKEA. There will be lots of fun, games, education, prizes, mascots, food trucks, face painting, adoptable pets from the MD SPCA and Baltimore County Animal Services, and much more. This event is focused on teaching the next generation about caring and kindness for animals in our community.